Too many years have passed for me to remember when I began reading Tony Hillerman’s mystery novels about the Navajo Tribal Police or even how many of his books I’ve read. All I know is that I was captivated with the first one, as well as the second and third — and however many more I inhaled. Eventually, I took a break so I could explore other writers. Finally, while on vacation earlier this month I picked up “Coyote Waits,” the 10th in his series of 18 books featuring Lt. Joe Leaphorn and Sgt. Jim Chee. After breezing through that paperback in a matter of days, I was reminded of the many reasons why I enjoyed his work so much. I found his novels highly accessible, characterized by a clean, crisp, uncluttered writing style. I loved the sense of place he created, with detailed descriptions of the geography and geology of the Four Corners area of New Mexico and Arizona. I admired his storytelling, the way he took you through so many twists and turns as he unraveled one crime mystery after another through the common-sense investigations by Leaphorn and Chee. Most of all, I appreciated his reverence for Southwest culture generally and the Navajo people in particular. A native of Oklahoma, Hillerman was a decorated World War II veteran, a former newspaperman and a journalism professor at the University of New Mexico. 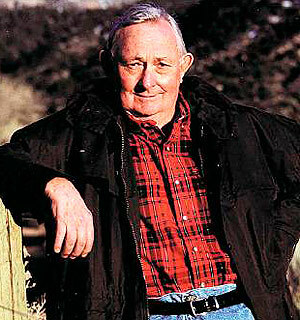 He was prolific, producing several non-fiction and children’s books in addition to the Leaphorn-Chee series. Reading “Coyote Waits” gave me the feeling of reuniting with an old friend on the sprawling Navajo reservation. Diving into the novel, it was easy to get caught up again in the imagery of the Southwest and the steady pacing of each chapter. I could see how he constructed the scaffolding of the story, how he brought major and minor characters in and out of the narrative, how he cranked up the tension as events built toward a resolution of the mystery. In other words, I was fully aware of being in the hands of a master storyteller. And it felt good. Hillerman’s daughter, Anne, has taken up the torch with the publication of a 2013 novel featuring Officer Bernadette Manuelito, the wife of Sgt. Chee, as protagonist. I’ll probably get around to it, but it’ll be on the back burner for a while as there are a few other books I’d like to get to first. For now, I’d like to appreciate the simple pleasure of a Tony Hillerman novel. He made it look so easy. Was it the fresh air that brought on the belated insight? Sometimes insight comes with a lot of effort: reading, thinking, observing, analyzing, trying to connect the dots. Other times, it arrives out of nowhere, like a 2-by-4 upside the head. If I’m gently rubbing my noggin while I write this, it’s because I had a 2-by-4 moment yesterday. 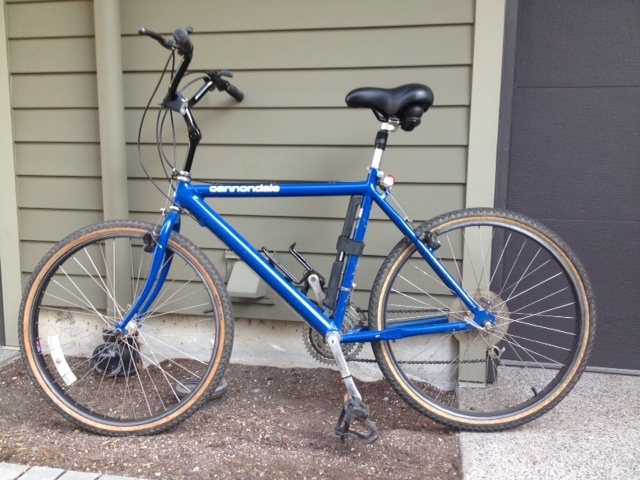 Call it the epiphany on two wheels. I was in a lousy mood (of my doing) Saturday afternoon. Rather than stew, I decided to go for a bike ride. With no particular destination in mind, no time constraints and, for a change, no earbuds, I found myself pedaling comfortably. Soon enough, I became aware of my tensions dissipating as I cycled from our neighborhood on a made-up route that took me past our old house, past the high school and park where our kids attended classes and played sports, and then out to other residential areas. On the spur of the moment, I decided to continue eastbound to pay a surprise visit to my daughter. I knocked on her front door (yes, she was surprised), went inside to see the latest home improvement projects she and her wife have done, and chatted a bit before leaving to ride back home. On the way back, I passed the newest apartment/condo buildings going up in our old neighborhood. I rode past an apartment complex known as one of the first places in Portland where Vietnamese refugees settled after the war. I saw a variety of scenes from everyday life — of kids playing on the sidewalk, of a guy cleaning out his barbecue grill, of a Street Roots vendor selling newspapers outside a grocery store. All of it made me appreciate the gift of my five senses. One, riding a bike is not only good for the lungs and legs, but for the heart and mind as well. I felt more relaxed than if I had run or driven the same route. Two, I don’t think I’d ever want to enter a bike racing competition — and maybe not even commit to a long-distance ride. I think doing either would detract from the freedom I felt just going wherever my whims took me at whatever pace felt comfortable. I have friends and relatives who spend a lot more time on their bike saddle than I do, and I respect their commitment to vigorous exercise. No doubt they’ve experienced many of the same benefits I’ve just described. Retirement is still a few years away, but I can imagine myself spending more time on two wheels once I’m freed of a work schedule. Heck of an insight, eh? 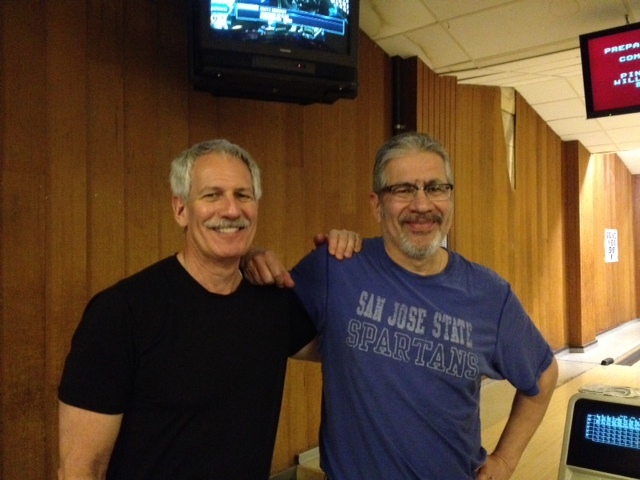 Ever since the fall bowling season ended in December, my friend Brian and l have dealt with a mild case of withdrawal. To go from bowling every Monday night to quitting cold-turkey has freed up an extra weeknight, to be sure. But it’s also eliminated a regular source of relaxation and friendly competition. I mean, really, how cutthroat can coed bowling be? The building looks tired – it’s basically a concrete box with a weathered, rusty sign – but inside we found a lively scene: families, teenagers, young singles, middle-aged women, all gathered together in a place that made you feel you’d stepped back in time. Think of an open book and how the pages lie on each side of the spine. That’s the interior layout of Interstate Lanes. Entering through an automatic sliding door, you encounter the front desk and cash register straight ahead. And then you do a double take when you realize there are 10 lanes on one side of the building and 10 lanes on the other side, separated by the front desk and, behind it, a cluster of four pool tables. Ten lanes on opposite sides of the building? Yep. 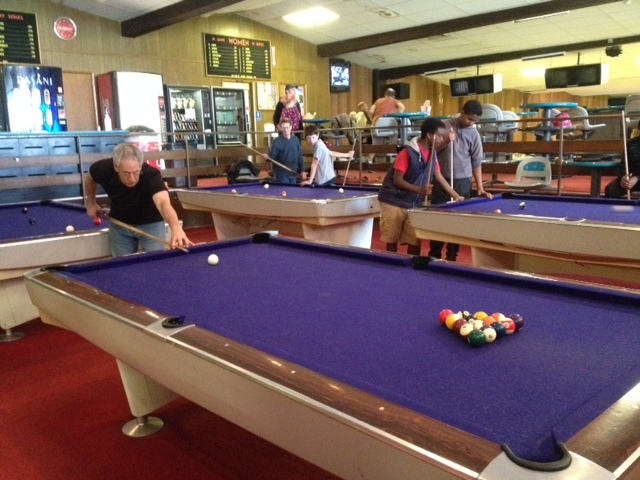 Beyond the billiards area lies the snack bar, offering the usual jojos and pizza, and restrooms. Up on the wall are the week’s high scorers, their first initials and last names spelled out on one of those old display boards with movable letters. The ceilings have more water stains than you can count and the automatic scoring screens are definitely retro, displaying none of the fancy graphics you’ll see at newer places. Though some might find it sketchy, I would disagree .The feeling is intimate, the vibe is friendly and the prices can’t be beat. 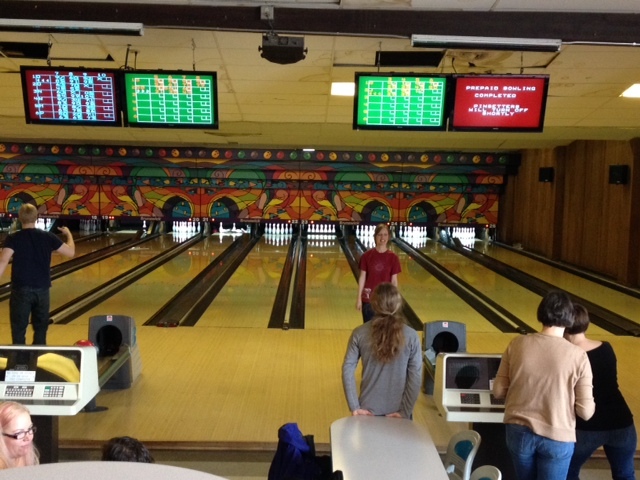 We bowled four games each at $2 per game – a grand total of $8 per person. Compare that to other places that charge $5 a game or $16 for a two-hour session. Between sips of Hefeweizen and handfuls of microwaved popcorn, we had our ups and downs after a long layoff from bowling. For every hot streak (or even a lukewarm one), there were plenty of missed spares and 7-10 splits to keep us humble. After we finished, I suggested an impromptu game of billiards and we wound up playing for an hour, giving us ample time to chat about our aging parents (Brian’s mom is about to turn 88, and my dad just turned 89) and their health issues. But what’s taking a heavier toll is the economics. 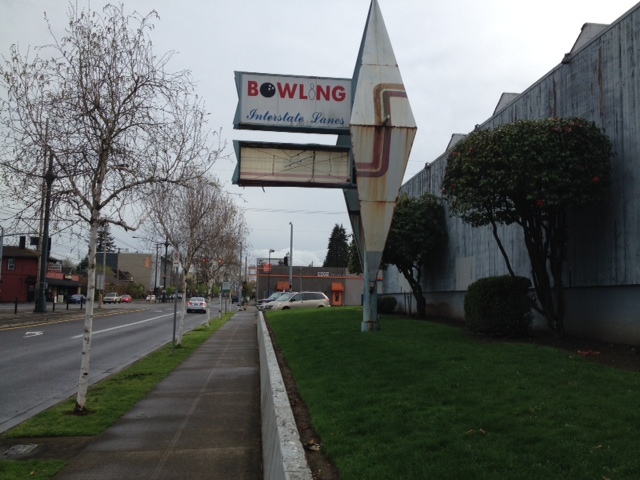 It takes a lot of money to maintain a bowling alley, and I can totally see why an owner would look to sell it to a business or developer looking to build a new retail store or apartments. Someday, maybe even soon, that may be the fate of Interstate Lanes. Until that day comes, I’m thankful knowing there’s at least this one old-school place to bowl. Few things annoy me more than someone who talks incessantly, barely pausing to let you into the conversation. Even more aggravating, someone who talks over you, as if what you’re saying doesn’t matter. To me, that’s not just bad manners, it’s a sign of disrespect. Like, what you have to say is so important that you can’t be bothered to wait until I’m done with my sentence before you start in again? 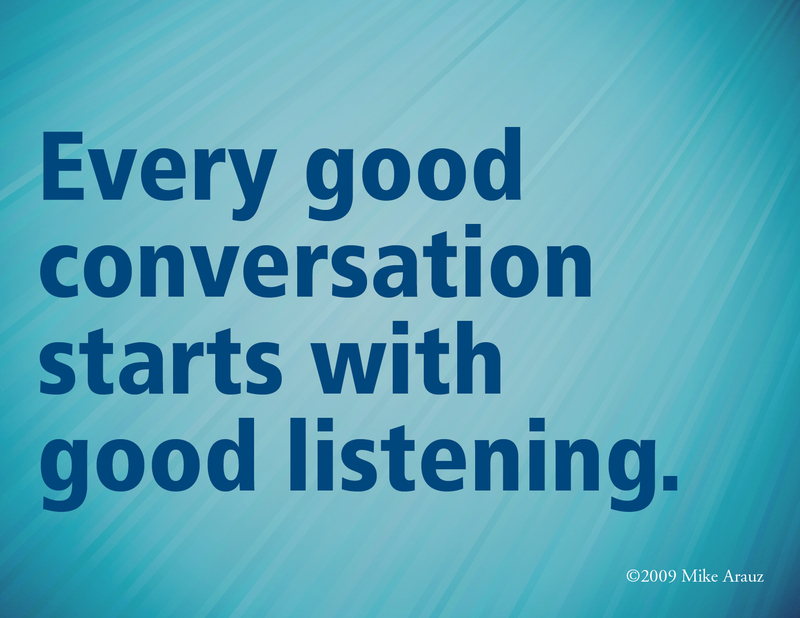 Being a good listener is important to me for another reason. As a journalist, it’s imperative that I have the patience to hear someone’s story without interruption, to get their words and tone, and the context, exactly right. Last night, I was reading a Tony Hillerman novel and came across a paragraph that captures my sentiments exactly. 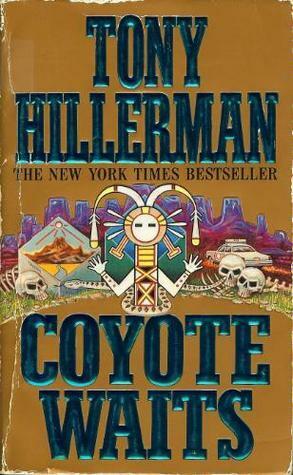 And if you’ve never read Hillerman, you should. Few writers convey the Native American experience as he does. A view of Eastsound village. The natural beauty of this place never gets old. 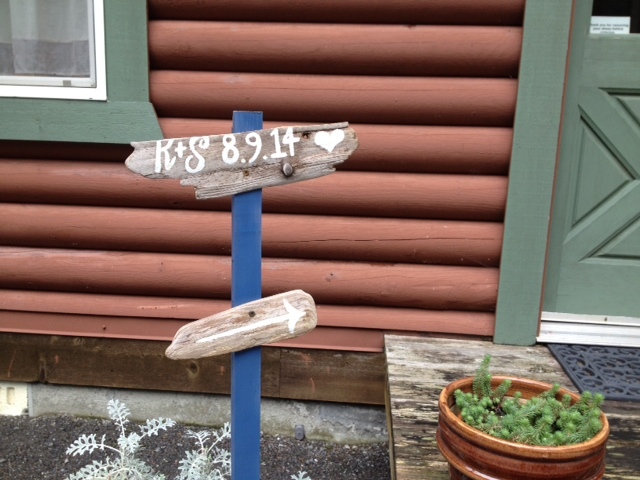 The last time we were on Orcas Island, it was August 2014. We came up for Simone and Kyndall’s wedding, and it was truly a magical time, celebrating with family and friends. But seven months had passed. Too long a time. So it was with great anticipation that we finally saw the calendar turn to mid-March and the planned weeklong getaway to our island cabin. As I write this, on the ferry from Orcas to Anacortes, I can say the past week was our most low-key ever – and yet no less satisfying. 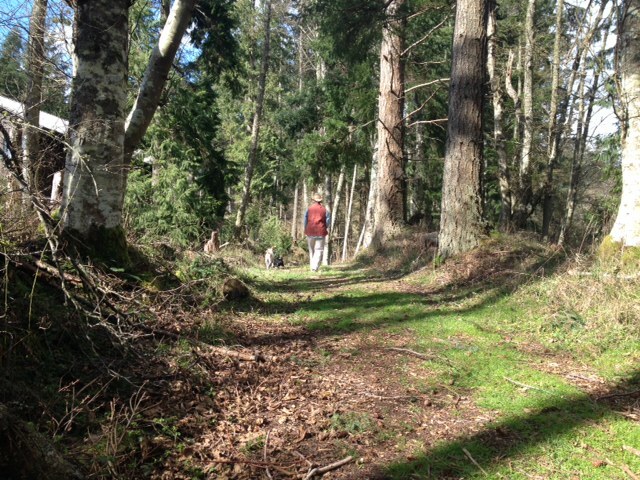 Lori walks part of the Lake Trail with Otto and Charlotte. Except for one quick trip into Eastsound and two even shorter trips to Olga, we were holed up the whole time at Eagle Lake. Part of it was the weather. Rain book-ended our arrival and departure. In between, we had sunshine, but we busied ourselves with chores one day and then mostly just hung out at the cabin, reading, playing board games and taking short walks with our dogs, Otto and Charlotte. All that down time was good for us. The weekly routine consumes so much energy, rising early every day, diving into work, walking and caring for the dogs, coming together for an evening meal and trying to make the most of two or three hours of evening time. 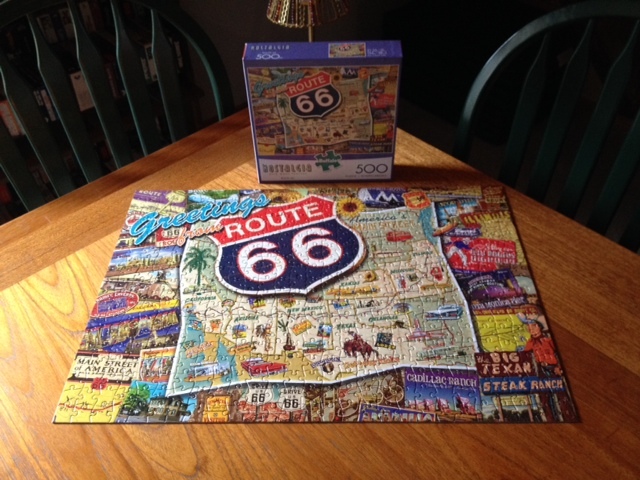 A 500-piece puzzle? No problem for Lori. Up at the island, there’s no schedule to meet, no appointments to keep. Just silence and solitude. A place to decompress and let go of daily concerns. As we head home, it’s a good time to reflect on the past week. Arrived in the late afternoon. Unloaded our stuff and sat down to a dinner of Thai leftovers from the night before. Went to dinner at the house of our good friends, Carl and Juliana Capdeville, the couple who are year-round caretakers at Eagle Lake. They invited Ben and Carma, two other permanent residents, to join us in a feast worthy of a restaurant: grilled oysters and shrimp, skewers of cod with teriyaki sauce, a make-your-own-salad, beef shanks and rack of lamb, followed by flourless chocolate cake and vanilla bean ice cream. Juliana is such a fabulous cook and she and Carl are such gracious, fun people. I think part of why we connected with them so easily is that they, too, have three kids (a girl and two boys) similar in age to our own. Plus, there are no pretenses about them. They are authentic and accommodating. They plan to pass through Portland in mid-April, so we hope to return their kindness then. 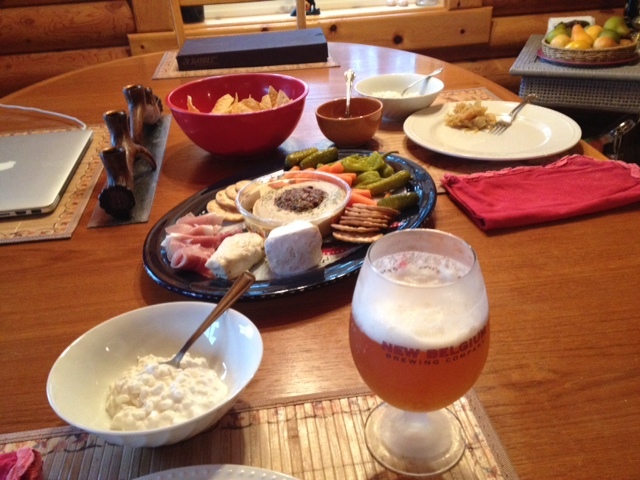 Hummus, crackers, prosciutto and other good stuff for lunch. Chores. Lori worked in the garden, added a few new plants, put up the bird feeders (too early for most species, but we did get several hummingbirds), etc. I cleaned out the rain gutters, split some firewood. Went into Eastsound on St. Patrick’s Day. 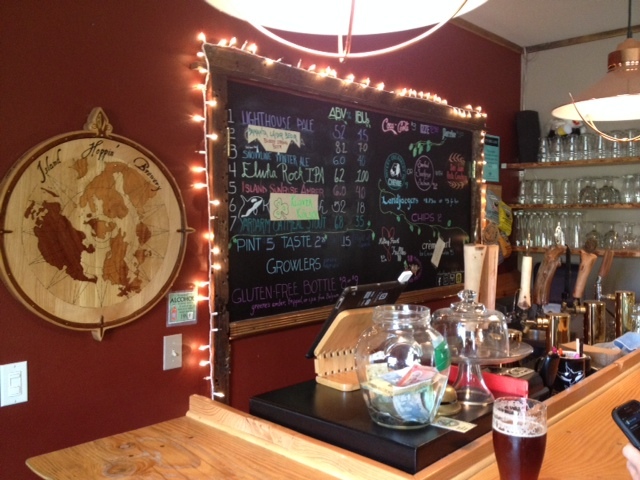 Checked out Island Hoppin’ Brewery, a charming little place with four tables and maybe four chairs at the bar. Had three samplers – a cucumber-infused Klover Klosch that Lori loved; an amber ale that was quite good; and a coffee/Kahlua porter that was off-the-charts great. Would have ordered a growler but they had only a limited quantity and wanted to save it for more tasting. A very friendly server named Becca, a transplant from western Michigan, waited on us. An old black Lab strolled through the tasting room. And we liked the place well enough to plan a return visit. Had lunch at Madrona Bar & Grill, a place situated right on the water, and were pleasantly surprised by the quality of the food. Another place we will want to return to. Island Hoppin’ Brewery is cozy, casual and a great place to sample the local brews. Back home again, enjoyed a luscious Irish dinner of corned beef, potatoes and cabbage. I am so lucky to be married to such a great and versatile cook. Took the dogs on part of the Lake Trail around Eagle Lake. Otto is 10 years old now, and a real veteran of our visits, so we don’t even need to leash him. Charlotte, on the other hand, is a 12-pound bull, pulling on her leash to the point of near-exhaustion. We figured she’d delight in all the senses of a new place and that she did. What we didn’t fully anticipate is that our walks would be shorter than planned, only because there was no let-up on Charlotte’s end. Charlotte’s senses were on overload during her first trip to the island. This was the day we had hoped to hike around Cascade Lake with just Otto. Unfortunately, I was laid low by a cold. Still don’t know where it came from but it was enough to cause me to take two naps and keep us grounded. 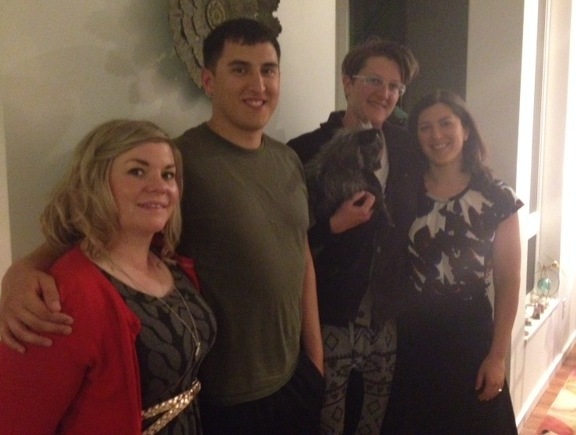 We had a delicious dinner, good wine and rich conversation. 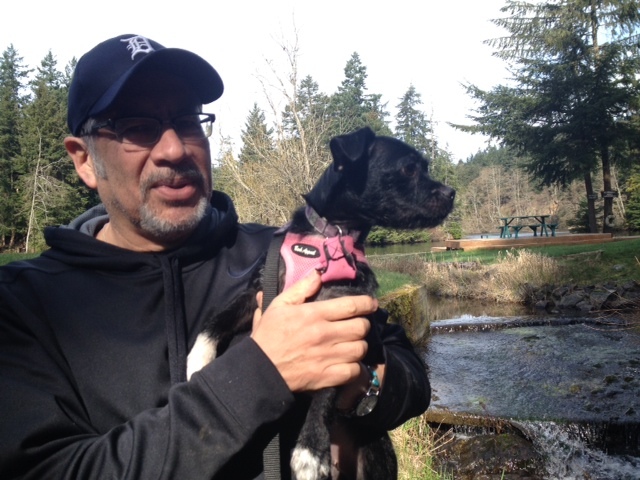 Left Charlotte in her kennel while we took Old Man Otto out to Obstruction Pass State Park for a short hike. We took a break at a picnic table overlooking Buck Bay and the western part of Orcas Island and just marveled at the splendor of the place. We could look over the cliff to the water below and see half a dozen orange sea stars clinging to rocks. To the north, we could view the town of Olga in the distance, with two small mountains rising behind it. 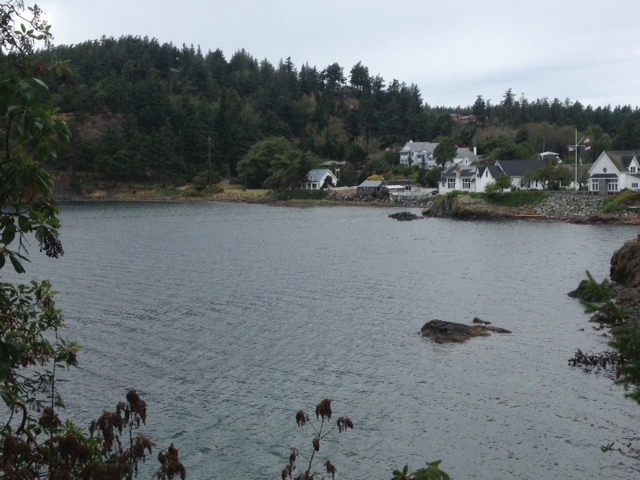 And to the south, we could look out toward other islands in the San Juan archipelago. So fortunate to have moments like those, feeling as if you’re the only two people on the island. Spent the afternoon cleaning up and packing up, preparing for an early morning departure, but treated ourselves to one dinner out. It was our first time at Doe Bay Café, just down the road, for anything other than Open Mic Pizza Night, where you can get a salad and pizza, but nothing else. 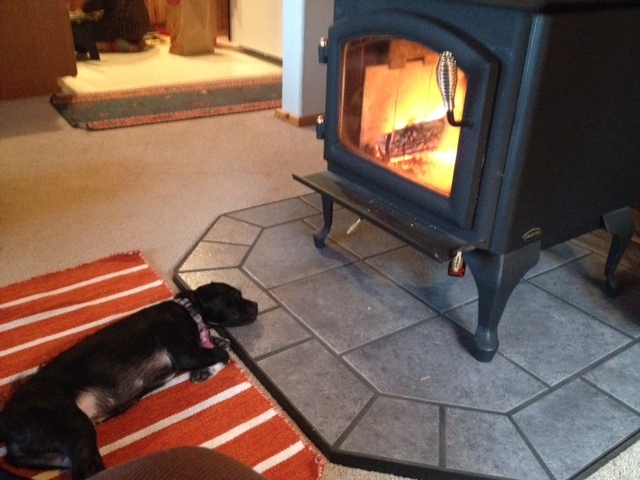 Another first for Charlotte: Soaking up the warmth of the wood stove. And, wow, what a dinner it was. Lori had scallops and I had king salmon. Both came with the freshest winter vegetables served in the most creative ways, and all of it was served by the best waitress we’ve ever encountered on the island: a woman named Cate, originally from Oklahoma. There was live music, a man and a woman on acoustic guitar, but we only had time to hear the guy. Dude had a great voice and was more than competent on the guitar but it was almost impossible to decipher his lyrics. Would have been nice to hear the lady, too, as she was the featured performer. But we had to get back to our four-legged friends and hit the sack early so we could rise in plenty of time to pack up and catch the ferry. Well…a longer post than I intended, but each and every visit to the island is special. I’ve said it before, but it’s a place that is truly enchanting. Your blood pressure drops as soon as you leave Anacortes, knowing it’s an hour-long ferry ride to the island, followed by another hour of 35 mph driving to the cabin. A reminder of our last visit: Kyndall & Simone’s wedding. Life slows down and you can’t help but go along. A week on Orcas is meant for relaxation – whether it’s running or hiking, reading or writing, fancy or casual dinners, spending time alone, with each other or with friends. Heading back to the mainland, we know what lies in store: Re-entry to the daily routine, re-engaging with too many people in too much of a hurry to get where they’re going. We plan to come back in late July, this time with our kids and their partners. But after this week’s R&R, we’re tempted to sneak in a short trip of our own, perhaps in late May or early June. 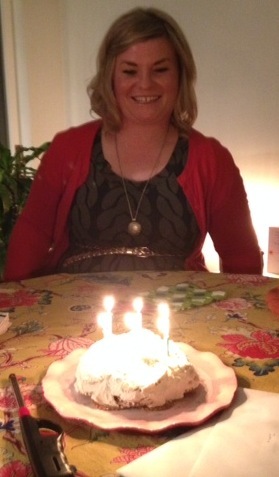 The birthday girl with her layered ginger cookie cake. Another month, another milestone birthday in the family. This past Tuesday, March 10, was the special day for daughter-in-law Jamie Lynn. She celebrated with Jordan that day and then the two of them drove down to Portland two nights later for a family celebration. Simone and Kyndall came over too (Nathan and Sara both had to work) and they joined Lori and me, plus Jamie and Jordan, for a light dinner, dessert and presents. It was No. 30. And it was such a nice evening, relaxing with a focus on the young woman who captured Jordan’s heart so many years ago at a summer horse camp. I’m sure it was the combination of jeans, boots, blue eyes and blonde hair beneath a cowboy hat that caught his eye. They’ve been married five years now and she’s been a constant source of support for Jordan during his stint in the Army and now as he’s returned to college. We’re happy to have them relatively close by – 3 hours by car – but wish we could see them more. We hadn’t seen the two of them since the Christmas holidays. 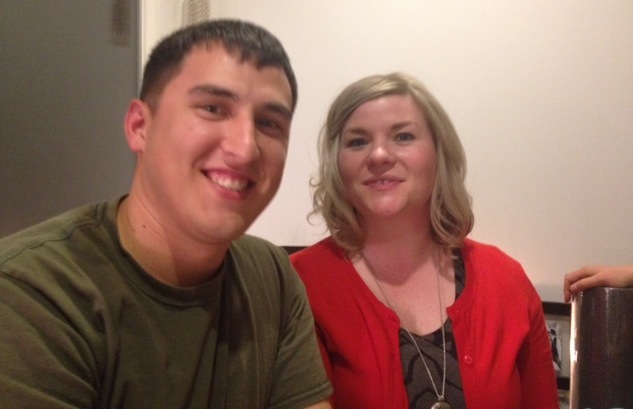 With Jamie working full-time and Jordan immersed in school and National Guard, their free time is very limited. Fearsome foursome (from left): Jamie, Jordan, Kyndall (with Templeton) and Simone. This week’s visit wasn’t just about candles and cake. It involved a practical aspect, too, in that they came down intending to sell their pickup truck and buy a used car. With some online research and a full day to follow up on Friday, they accomplished their mission: an orange 4-door Honda Fit. Jamie and Jordan left Saturday to return home. We hope to see them again in exactly a week, passing through the Tacoma area on the way back from our island cabin. Wishing the best to Jamie Lynn as she kicks off another decade of fine living. 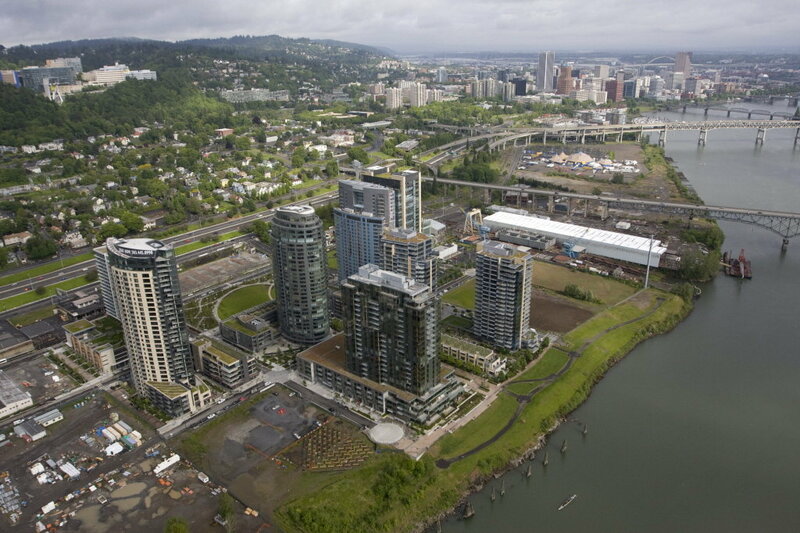 An aerial view of the South Waterfront district with downtown Portland in the background. Urban planners often get a bad rap. Their notions of how people want to live, work, recreate and commute often are at odds with reality, sometimes revealing more of an attraction toward what’s cool rather than what’s practical. But after a long bicycle ride this past weekend, where I ventured into a part of town I seldom frequent, I had to tip my hat. In the case of South Waterfront, a still emerging neighborhood of high-rise condos and trendy restaurants, I think our city planners have done some fine, if incomplete, work. There was a time when I used to do very long Sunday morning runs in this area, back when it was still an industrial no man’s land that was seldom visited by more than runners and cyclists. Now it’s blossomed into an upscale area with a network of bike paths, an aerial tram, upgraded tracks for the Portland Streetcar, food carts and popular eateries (Lovejoy Bakery, Little Big Burger, Cha Cha Cha) and a cluster of condominium towers that are actually attracting residents. Three public universities joined in opening a Collaborative Life Sciences Building last summer and now even “normal” businesses, like H&R Block, are setting up shop. The area is easy to navigate, as it’s essentially one north-sound strip with just a few perpendicular streets and a nice little couplet at the southernmost end. 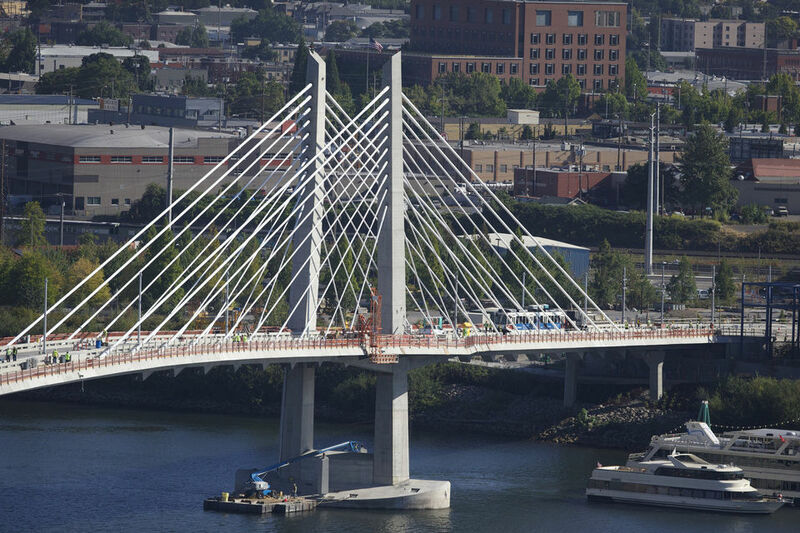 South Waterfront also will connect to the new Portland-to-Milwaukie light rail bridge when it opens in September. It’s a beautifully designed structure and one that I expect will see a lot of traffic. Named Tilikum Crossing, it’s designed to carry light rail trains, buses, cyclists, pedestrians and streetcars, but not private vehicles. Tilikum Crossing, still under construction, will carry several modes of traffic — but not private cars — when it opens in the fall. The area is still short — way short — on trees, but I noticed several plantings up and down the streets. When they mature, they’ll give the area more of a Portland feel. South Waterfront is the largest urban renewal project in the city’s history. And during the depths of the recession, when empty condos were being auctioned at bargain prices, some feared the area would be a colossal failure. But the economic recovery and a few years of patience seems to have helped South Waterfront turn the corner. Would I want to live here? No, I don’t think so. It’s too vertical for my taste and I’m not particularly enamored with the location, far from more established residential neighborhoods. But for a weekend visit? Sure. And if I were a tourist of means, I could see myself hanging out here. As a taxpayer I’m grateful city planners had a vision to transform a brownfield into a residential-commercial area with potential to contribute greatly to the city’s tax base. I hope the succeeding years keep the momentum going. I don’t imagine South Waterfront will ever have the appeal of the Pearl District, the city’s similarly transformed urban renewal area. But I will readily admit the area is showing signs of tapping its long-term potential. Read more: South Waterfront: The failure that wasn’t, Portland Business Journal. The Oscar buzz is starting to fade but it’s not too late, says I, to weigh in on one more movie. 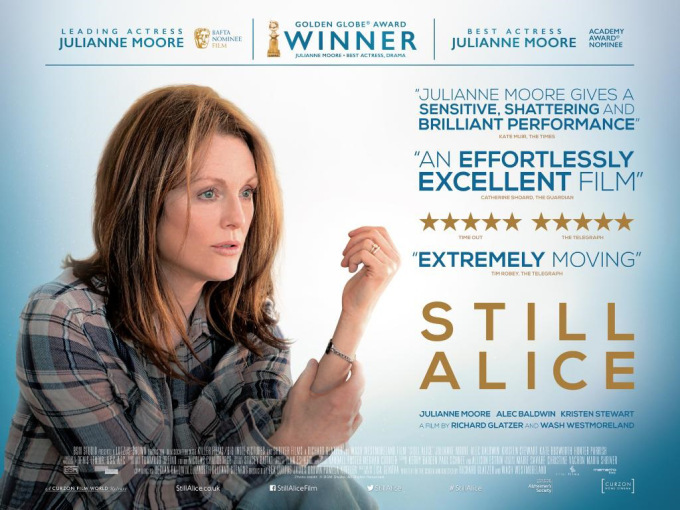 “Still Alice” is a very good film about the ravages of Alzheimer’s disease, and it features a superb performance by Julianne Moore in the title role. In my opinion, Moore is one of the top five actresses in the industry. This role gave her the opportunity to shine and that she did. No wonder she was considered a lock for the 2015 Oscar for Best Actress. First, the movie. It’s compelling stuff. We follow the physical and mental challenges confronting a vibrant 50-year-old linguistics professor who is diagnosed with early-onset Alzheimer’s. We mourn with her as she experiences memory loss, deterioration of her physical abilities and, worst, any sense of self-control over her life. It’s touching and agonizing at the same time as the disease crowds in on every aspect of her life. It affects her job performance; changes the dynamic with her equally ambitious husband (played by Alec Baldwin) and three adult children; and forces her to confront her own mortality. Kristen Stewart, best known for her “Twilight” role, is startlingly good as Lydia, the youngest and most honest of the three children of Alice Howland, played by Julianne Moore. Second, the acting. Of the five Best Actress nominees, this makes three performances I’ve seen. Julianne Moore was head and shoulders above Felicity Jones and Reese Witherspoon; I have yet to see Marion Cotillard or Rosamund Pike but I can’t imagine either eclipsing Moore. As Alice, Moore is equally convincing as a powerhouse professor at Columbia University — a Type A wife, mother and professional who seems to have it all — as well as a vulnerable woman sliding into an irreversible disease that steals her dignity and her very identity. As much as I love Meryl Streep, it’s good to see another industry veteran get rewarded for a brilliant performance. Meryl or no Meryl, this year Julianne Moore was in a class by herself. 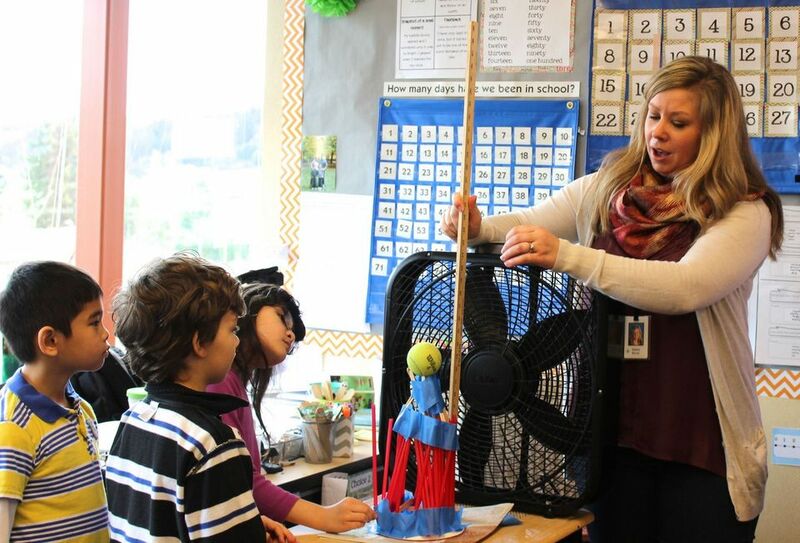 Teachers at Scouters Mountain Elementary in Happy Valley are working to implement growth mindset teaching practices, which encourage learning through failure. Maybe it’s not too late for me to transfer in? If I were to make a list of my shortcomings, it wouldn’t (ahem) be very short. I’ve always tended to be too self-critical for my own good. Lately, I’ve been thinking about my fear of failure. I’ve touched on the topic at least twice before — once, very directly, when singing the praises of a book by a New York friend (“Some Nerve” by Patty Chang Anker) and again, indirectly, in a self-deprecating piece (“A dull boy”) where I admitted I was anything but a thrill-seeker. Well, the topic has come up again, with examples from Silicon Valley to Happy Valley, and today I feel compelled to share a few observations. Then maybe, just maybe, I’ll realize there are more constructive ways to deal with my good old friend (fear). Naturally, there’s much discussion about the entrepreneurial ethic that defines Silicon Valley, where so many successful startup executives freely admit to failing at least once, twice — heck, multiple times — before finding success. There’s a short interview with the woman who founded FailCon seven years ago — a daylong conference where people talked about failure in a cathartic way, as a means of bringing greater transparency and honesty to the creative process. There’s a ranking of the different types of failure — from the simple mistake to the breakdown, flop and flameout to the even-worse “f***up and *sh—ing of the bed” (doing something so dramatically terrible that everyone is forever dirtied in the process). And there’s an introduction to “F***Up Nights” — casual gatherings with booze where entrepreneurs are given 7 minutes and 10 slides to share their lowest moments in an act of professional purging. There’s so much talk of failure it almost seems you’re a failure if you don’t have your own story of screwing up. Then there’s something closer to home. In one suburban school district near Portland, teachers at an elementary school in Happy Valley are teaching their students that failing is a crucial step in the learning process — something to be embraced rather than seen as negative. Laura Frazier of The Oregonian/OregonLive reports that educators in the North Clackamas School District are teaching students as young as second grade that their academic success depends on their attitude. “By implementing a philosophy called growth mindset, which emphasizes that intelligence is malleable as opposed to a fixed trait, teachers hope to equip students to overcome challenges,” Frazier writes. 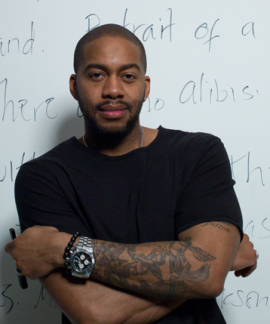 Mitchell S. Jackson’s debut novel, “The Residue Years,” is the 2015 Everybody Reads selection for Multnomah County. Interestingly, the word “failure” doesn’t even appear in the Q&A. Yet the concept is evident throughout, as Jackson recalls the intimidation he felt as a young, inexperienced teacher at NYU; the ambition to become a writer that, even after doing prison time, gave him a sense of purpose; and the encouragement and self-confidence that came from having a piece of his selected to be in an anthology of African American writers. So, with all this direct and indirect talk about failure, how does this fit in with my experience? I’ll admit that I shy away from activities — like art — that I don’t think I’m very good at. Same goes for certain topics — like science — where basic concepts elude me. I know where these feelings began. Back in grade school, one summer school teacher gave me a C in an arts and crafts class. In high school, I struggled to get a C in biology, chemistry — even general science. When I found something I enjoyed and apparently had some talent for — journalistic writing — I was delighted. Over the years, I guess my comfort zone in that field has expanded while it has remained static in other areas of my life. It sounds silly, even ridiculous for someone my age to admit this, but if I don’t think I’m going to do something reasonably well, I tend to avoid it. So much for personal growth through trial and error. Reading all these recent pieces about failure make me realize I’m being foolish, maybe even cowardly. If 7- and 8-year-olds can grasp that failure is part of learning; if all these California entrepreneurs can wear their failures as a badge of honor; if a young Portland author can find success writing about his hometown — well, then, surely I can draw a lesson from all this, can’t I? It’s about perseverance. Resourcefulness. Huumility. It’s about having an ego healthy enough to accept help and to realize that not everything has to be good or great on the first try. Often, it’s the process, not the product, that matters. I’ll try to take this to heart. Starting now. What about you, readers? Are you fearless or fearful? Of what? Parfait Bassale with Eric and Sue Wilcox. The evening began at a brewpub. It was supposed to continue at a small coffeehouse. 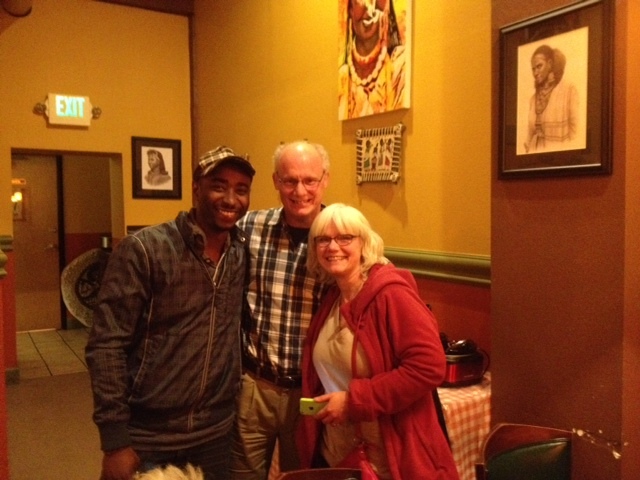 Instead, we wound up at an African restaurant. In January, three of us couples had purchased tickets to attend an EP pre-release concert by our friend and former neighbor, Parfait Bassale. The poor guy came down with laryngitis and had to postpone the event to late February — as in last night. 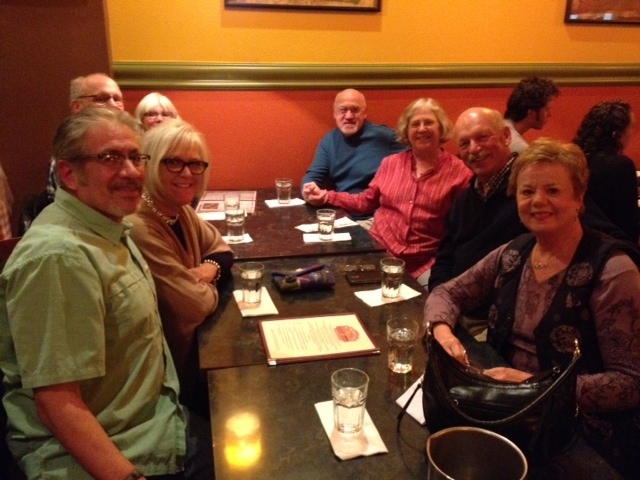 We added one more couple to the mix, so eight of us gathered at Old Town Pizza for a pre-concert meal and drinks. A perfect choice, it turned out, because all we had to do was walk half a block to the door of the coffeehouse for Parfait’s concert. An inadvertent discovery: a cool little place near PCC-Cascade. Imagine our surprise when we approached and found the place darkened and the doors locked. Fortunately, someone associated with Parfait told us the concert had been moved to a new location and gave us directions. 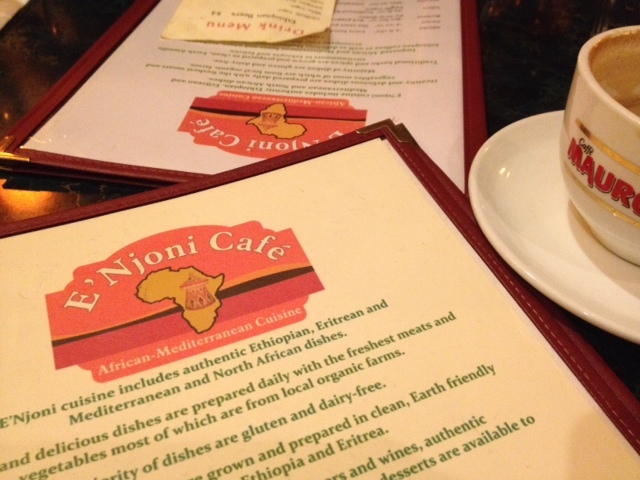 A few minutes and one mile later, we found ourselves at E’Njoni Cafe, a restaurant on North Killingsworth serving Ethiopian and Eritrean cuisine, where Parfait had set up in a small space near the entrance. For the next hour, he played a set of original compositions, starting with electric guitar and finishing on acoustic with an accompanying bass player. Admittedly, it was hard to fully appreciate the music over the sounds of people have dinner and multiple conversations. Even so, you could hear ear-pleasing melodies and Parfait’s rising vocals over the background noise. And though we’d arrived with bellies full of pizza and salad, we all had a beverage and a couple of us sampled the house-made tiramisu while we listened. Afterward, Parfait came back to our table in the rear of the restaurant and told us what had happened. He arrived at the coffeehouse two hours ahead of the scheduled concert time to set up, only to find the proprietors were a no-show. With no contact information other than a business phone that went unanswered, he was left to figure out a Plan B on the fly. Fortunately, E’njoni was able to accommodate him — and so probably half the restaurant’s patrons got a free concert while the rest of us ticket holders got introduced to a place with a tantalizing menu sure to draw us back for dinner. I’d call that a win-win situation. After the evening wrapped up, I reflected on how we all came together and realized I’d been the connector. It’s a role I happily embrace, bringing together people Lori and I know from different phases of our lives and seeing new connections being made. Clockwise from left: George, Lori, Eric, Sue, Keith, Lynn, Bob and Deb. Bob and Deb Ehlers, who we’ve known since Salem when we became parents within two days of each other with their Christopher and our Nathan. Eric and Sue Wilcox, our Northeast Portland neighbors, raising two boys and a girl two blocks away from our two boys and one girl. Their youngest, Becca, and our youngest, Jordan, likewise were born just a couple days apart. Lynn St. Georges and Keith Cantrell. I met Lynn a few years ago when I was in an editing role at The Oregonian, after she’d suffered through the deaths of her husband and mother, and we became friends. In an amazing second act, she met and fell in love with Keith. Bob, Eric and Lynn — and Lori — all have written for my Voices of August guest blog project and now all of the spouses and significant others have met each other. Add Parfait to the mix, too, because he allowed me to use a republish a piece he wrote for his own blog for VOA 4.0. Check out Parfait’s website or follow him on Facebook.